apaiser™ is thrilled to be launching its stunning new collection ‘The Chameleon’, that challenges conventional perception. 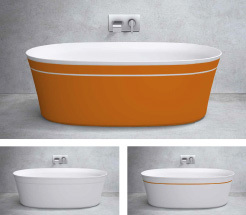 Driven by a desire to create an alternative option for bathware designers, apaiser has crafted a collection which is bold, distinctive and individual. The Chameleon collection is all of these and more, designed in collaboration with award winning product designer Paul Flowers. Like a Chameleon, the collection is adaptable – the simple lines complement a range of architectural styles, yet the diverse colour palette allows expression of personality – to blend harmoniously and calmly within the environment, subtly catch the eye with a hint or suggestion of tone, or be bold and create a sculptural focal point in an explosion of colour. Styled by nature. Perfected by hand. 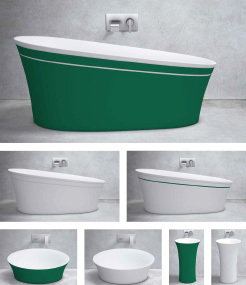 The apaiser™ story starts with award-winning bathware, proudly created and designed in Australia. Strengthened by man and inspired by the purity of nature, apaisermarble® is a luxurious non-porous marble material, enriched with beautifully pure Australian minerals. Paul Flowers is a globally renowned, award winning product designer, born and educated in the U.K. With an extensive portfolio of creative and innovative development, he has designed iconic products for leading international brands. Paul’s approach to design is simple, his ethos that the product ‘should function as beautifully as it looks’. The brand values of apaiser are a good fit with my own philosophy; using the finest quality materials, and a relentless drive for perfection in design.